I would like to share a few memories about Kiwi and a bit about her last days with us. I needed some time, since this has really been hard on me. Kiwi was strong. Sick since mid August, Kiwi fought to be with us for an entire month. It was really hard to watch such deterioration in such a beautiful bird with so much life. I tried so hard to save Kiwi and Kiwi tried so hard to be with us. However, on September 16th I had to make a decision, to take Kiwi to the animal hospital and allow Kiwi to finally rest. That morning, her condition drastically took a turn for the worst. Even though it was getting bad, I had this little hope Kiwi would pull through. That maybe, everything would be okay. But that came to an end that morning. I won't go into details since its something I would't wish upon any one to have to witness, but will say, she was suffering. I never thought I would have to make that decision. We comforted her as much as we could, played her favorite songs, and showed her pictures of Birdie since there was no chance of them saying goodbye to each other, and told her how much she was loved. We also planted a perennial in the garden that only blooms one flower in fall in her memory. We got Kiwi when she was very young (before she lost her baby bars). From day 1, Kiwi had so much energy, was so curious about everything and had such a playful nature about her. She loved carrots, loved shredding toys and swings, loved showers, and loved to sing and squawk. Her favorite toy was the Olympic rings. At first, she would slam them against the cage wall. Then one day, she discovered she could climb them and go through the hoops. After that, she would 'have' to go through the hoops to get to perch. Every time. First thing in the morning when I would prepare there food, Kiwi would tell me to hurry up with the food by jumping on the cage door and chirping. So much personality. She loved country music. And so every night, I would play Paul Brandts "i do" song and sing it to her, and replace "baby" with "Kiwi" . She also brought out the best in Birdie. After 30 days of quarantine, and a few weeks of slow introductions, they became instant best friends. I even recorded the first time they met each other outside the cage. From that day on, they did EVERYTHING together. Birdie began to eat pellets and carrots, started to play with toys, all firsts for Birdie after months of trying. And with Kiwi's encouragement, they started to explore the world beyond the cage. Kiwi also taught Birdie how to flip cups and squawk. That's a beautiful tribute and very heartfelt. 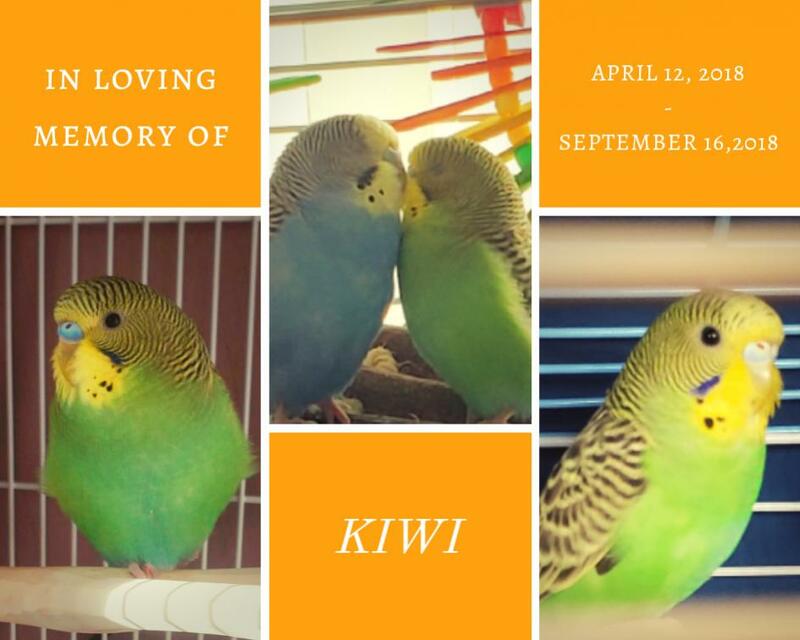 Kiwi was obviously a very special little budgie and she's left you with precious memories that are yours forever. I hope you and Birdie are doing ok.
Beautiful tribute to your darling Kiwi. Fly high and soar freely sweet Kiwi; rest peacefully now beautiful girl. She obviously was so loved during her time with you! Now she's watching over you always. Rest in peace, darling Kiwi. Fly high among the stars. Lovely tribute, so sorry for your loss. I’m so sorry for the loss of your precious Kiwi. It’s evident how much you loved and cared for her. Sending comfort to you and Birdie. I am so sorry for your loss. Stay strong with Birdie. Keep Kiwi in your memories, right next to you. I am so sorry to hear of Kiwi's passing. She was well cared for budgie. It's hard not to blame yourself. It sounds like you did everything the right way. My heart goes out to you and Birdie.